Sambar powder or sambar masala recipe - South Indian Idly and sambar is world famous. The key secret of tasty sambar depends upon the sambar powder that is used to make it. There are several versions of preparation of sambar powder. The recipe varies from person to person. 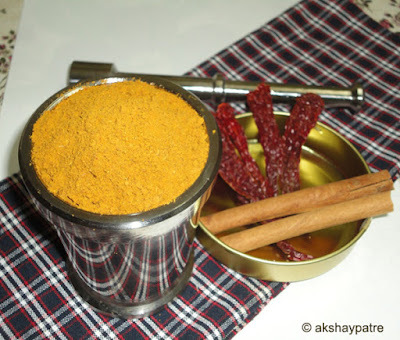 This sambar powder recipe is my family's traditional recipe that we have been using since several years. It is the perfect blend of spices that give out a perfect sambar flavor which creates a desire to eat more and more idly and dosa with it. In general, sambar powder is made using some dry coconut. But, I haven't prepared it with dry coconut to increase the shelf life. If you would like to have a flavor of coconut in your sambar, you may add half a cup of roasted dry coconut in this recipe. Otherwise, you may use fresh coconut paste while preparing the sambar. I have also used a small quantity of byadagi red chilies so that the sambar powder is not very spicy, as small kids do not like the hot chili taste. If spicy taste is required, chili powder can be adjusted to suit the taste while preparing the sambar. Handpick and clean the chana dal. Roast the chana dal in a pan on low flame till they become crisp. Roast in 2 batches. Set aside. Handpick and clean the urad dal. Roast the urad dal in the same pan on low flame till crisp. Set aside. Handpick and clean the coriander seeds. In the same pan, on low flame, roast the coriander seeds till they become warm. Set aside. Handpick and clean the jeera. In the same pan, on low flame, roast the jeera till they become warm. Set aside. Heat little bit of oil in a small pan and fry the fenugreek seeds (methi dana) till aromatic and golden brown. Set aside. Heat little bit of oil in the same pan and fry the lavang, dalchini and black pepper separately on low flame until they turn crisp and aromatic. Set aside. Heat little bit of oil in the same pan and fry dry red chilies on low flame until crisp and golden brown. Set aside. In the meantime, wash and spread the curry leaves on a thin cloth and allow them to dry. When the leaves dried, heat some oil in the same pan. Fry the curry leaves on low flame till they become crisp. Set aside. Combine together all the roasted and fried ingredients and allow it to cool. Put the ingredients in a mixer jar. Add asafoetida (hing) powder and turmeric powder. Blend it to a fine powder to make a smooth sambar powder. Blend it in 2 - 3 batches. Transfer the sambar powder to an airtight container and close with a tight lid. 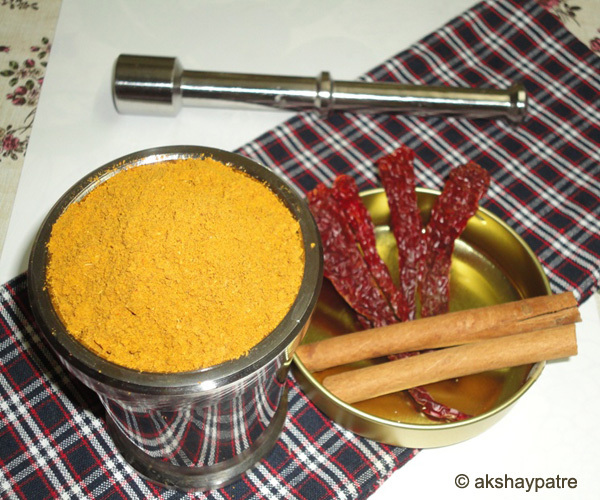 This sambar powder or sambar masala can be stored for about a year. 1. Handpick and clean the chana dal. Roast the chana dal in a pan on low flame till they become crisp. Roast in 2 batches. Set aside. 2. Handpick and clean the urad dal. Roast the urad dal in the same pan on low flame till crisp. Set aside. 3. Handpick and clean the coriander seeds. In the same pan, on low flame, roast the coriander seeds till they become warm. Set aside. 4. Handpick and clean the jeera. In the same pan, on low flame, roast the jeera till they become warm. Set aside. 5. Heat little bit of oil in a small pan and fry the fenugreek seeds (methi dana) till aromatic and golden brown. Set aside. 6. Heat little bit of oil in the same pan and fry the lavang, dalchini and black pepper separately on low flame until they turn crisp and aromatic. Set aside. 7. Heat little bit of oil in the same pan and fry dry red chilies on low flame until crisp and golden brown. Set aside. 8. In the meantime, wash and spread the curry leaves on a thin cloth and allow them to dry. When the leaves dried, heat some oil in the same pan. Fry the curry leaves on low flame till they become crisp. Set aside. 9. Combine together all the roasted and fried ingredients and allow it to cool. 10. Put the ingredients in a mixer jar. Add asafoetida (hing) powder and turmeric powder. Blend it to a fine powder to make a smooth sambar powder. Blend it in 2 - 3 batches. 11. Transfer the sambar powder to an airtight container and close with a tight lid. This sambar powder or sambar masala can be stored for about a year. Homemade is always good.. this is a very handy podi..